The recently reveled 2018 Honda Accord spy shots posted by Autoblog show very little of the new model because of the heavy black camouflage. We are able to discern a few things about the exterior and we have some strong predictions of what Goshen and Monroe drivers can expect based on the previous 2017 model. Keep reading to learn more about what we know so far about the 2018 Accord. While the few spy shots that we have obtained of the 2018 Honda Accord leave plenty for the imagination, we are able to spot that the overall body shape has a sleeker design than the 2017 model. The angles are sharper and less box-like than previous models, giving it a higher-end look and feel. You can see from the spy shots that the headlights appear to be wide and narrow, and they look very similar to the current Projector-Beam Halogen Headlights that come with the 2017 Honda Accord. Although the side mirrors are covered up, we think that it’s a strong possibility that there are integrated LED turn indicators under the camouflage, which could be standard on all trims. Currently the 2017 Honda Accord offers Goshen and Monroe drivers a 2.4L 4-cylinder engine and a 3.5L V6 engine. It’s expected that the 2018 Honda Accord will likely ditch the V6 engine in favor of a turbocharged 4-cylinder similar to the one that will be available on the 2017 CR-V. The move is in line with competitors that are only offering 4-cylinder engines with an optional turbocharged version. It’s also likely that the continuously variable transmission becomes the standard and that the Hybrid powertrain remains the same — but none of this has been confirmed. Honda’s impressive Honda Sensing suite of driver-assistance technologies continues to be a sought-after feature on every model. 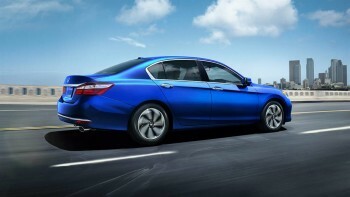 It’s probable that the higher-end trims of the 2018 Honda Accord EX will come with all of the Honda Sensing technologies as standard, including Adaptive Cruise Control (ACC), Lane Keeping Assist System (LKAS), Collision Mitigation Braking System (CMBS), and Road Departure Mitigation System (RDM). The current 2017 Honda Accord has a lot to offer Goshen and Monroe drivers in terms of comfort and convenience, and it’s available now at Middletown Honda. Unfortunately, the 2018 model won’t be available for another year, but we’ll keep you up to date with the latest information as it is released. If you have any further questions, feel free to contact us online or stop by our showroom. We look forward to seeing you soon!